For the cost-conscious camper looking for an inexpensive, quality camping product, the Genji Sports Self Expanded Screen Tent is worth considering for your next expedition. Lightweight and easy to manage, the Genji is a great option for campers looking for a reliable but cheap option for a tent for 1-3 people. The recession and persistent tough economic conditions have made it tougher for many of us to enjoy our favourite outdoor activities. These days, if you want to camp, you have to find ways to cut costs as many cash-strapped parks and campgrounds have raised fees. One way you can make camping more affordable is by finding less expensive camping gear. Less expensive does not have to mean lower quality, however. Are you hitting the jungles anytime soon? Are you preparing for a hike or expedition that’s going to take more than a day? Well, human nature requires that we offload the pressures of life by taking a time off to stay in tune with what nature has to offer. Until you take a moment off the hassles and bustles of the city life, you won’t realize just how much you’ve been missing. In fact, doctors now say that this kind of break is very necessary if you want to stay healthy. However, with every trip in the bush, there’s need to have good shelter at the end of the day. You’ll need to protect yourself from the hash weather conditions, roaming animals of the night, and perhaps, save yourself from the cold. Other than the comfort that a hiking tent can come with, it’s very necessary that you choose a tent that’s light in weight and easy to carry. We are talking of ease with which you can put it in a backpack and carry it without any difficulty. Small tents can carry up to 2 people at a time. However, larger ones accommodate as many people, say 6, 8, 10 etc. 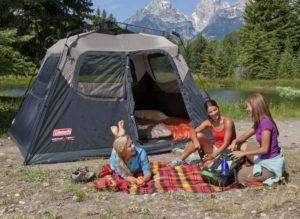 In line with that, we’re reviewing the Coleman 6 Person Instant Tent, which has proved to bring convenience in whatever place you choose to hike at. 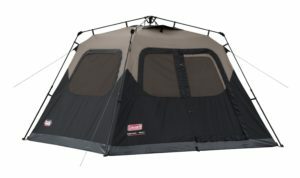 This tent will save you from expensive hotel or lodge accommodation, and is as comfortable as sleeping in a hotel room. 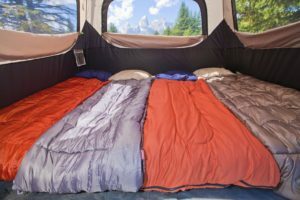 For your next hiking or camping adventure, take a moment to consider what it would be like to get to camp, pop open your tent in under one minute, and have your tent ready to go for up to six people. Once your tent is put together we all know that we can then go about preparing food and relaxing from the day’s events. The Coleman 6 Person Tent is one designed to be lightweight, easy to transport, and very easy to set up. Forget about losing parts or messing with fold up rods. The Coleman 6 person tent comes with everything already put together, so all you have to do is stretch it out, extend the poles, and lock it into place. It can be done in thirty seconds. To know what this tent is capable of doing and what it cannot do, it’s only fair that we review its features. We definitely know that it’s going to make the ideal choice of tent you’ve always been looking for in your camping expeditions. It can only accommodate up to a maximum of 6 people, so if your group comprises of over 6 people, then it won’t be able to accommodate all of you, unless you look for a bigger tent, still by Coleman Instant Tent. This tent is one of the easiest to assemble, why? Because poles come pre-attached to the tent, which ensures that you save time when setting it up. This also eliminates the risk of losing parts. It is as simple as unfolding the tent, spreading out the fabric, extending poles as needed, clicking and locking. That’s it! It measures 10X9 foot to fit up to 6 individuals. The floorspace is just big enough to accommodate up to 2 queen air mattresses. It also has a 6-foot center height. In short, space is not a constraint inside this tent, as long as you are not more than 6. And because of the 6-foot height, it will accommodate just about any height irrespective of how tall or short one is. And during rainy seasons, you will always stay dry and comfortable with the high-tech features of the Coleman 6 Person Instant Tent. It comes with a feature called WeatherTech system, with a series of features that work together to enhance your comfort during one of those bad days. When you’re dry and comfortable in the bush, you tend to sleep better till the next day. This is the only way to enjoy your hiking experience, isn’t it? Lastly, we also loved the fact that this tent comes with a limited one-year warranty to cover you, just in case something goes wrong with your tent before that period elapses. However, it’s very rare for customers to experience such cases since Coleman tents are generally strong and durable. They have been proven to last as long as the manufacturer has stated. On the inside of the tent, the dimensions on the floor are nine feet by ten feet, and the ceiling height in the middle of the tent is six feet. An amazing space which can fit two twin sized air mattresses, or even up to six people in sleeping bags and mats. The rods insert into the ground and the entire thing locks into place with ease. The Weathertec technology and structure and design of the tent are created specifically for rainy conditions and this feature will keep you dry in windy and rainy situations. For those hot summer situations, the tent comes equipped with screens on the side to allow free air flow throughout the tent, and you will benefit from any breezes or wind on a hot summer day or night in the tent. This six person tent is ideal for any type of camping situation where one man carries the tent, and others carry other important gear. When hiking or camping, this is an ideal tent for smaller groups of hikers to find comfort and shelter in cold or rainy situations. It also keeps pests and bugs from attacking you at night. It will keep other snakes and rodents out of your tent as well due to the well-designed zipper mechanism. Feel comfortable and at ease in this wonderful tent for all camping and hiking, and outdoors fun. Everything is built in and attached already to the tent, so you don’t have to mess around with loose parts, and worry about losing any parts to the tent. It is all right there, ready to go, whenever you are ready to set it up. Camping should be fun, and this tent makes it a lot easier to set up camp. Then you can have time for the most enjoyable aspects of camping, such as building a fire, enjoying a few drinks, eating, and socializing with your fellow campers. If you prefer to wait until right before you get ready to go to sleep to build your tent, then you have that option. You can simply snap it all together, lock it, and tie it down all in under one minute. Then you are ready to sleep in comfort. This is literally a home-away from home, so expect to have shelter that’s equivalent to the one you get at home. We also looked the interior of the tent, and it was just amazing. The tent is weather-proof, thanks to the WeatherTech systems which consists of inter-working features that resist even the heaviest rain. It has windows, strategically placed to let sufficient light inside the tent. The windows also lets you see what’s happening outside. It’s just a home that’s away from home. No need to worry. It comes with a 1-year warranty which guarantees cost-free service when things go wrong. This is one of the longest warranties you can find on a tent. It’s easy to set up because it comes with pre-attached poles, which also eliminates chances of losing important parts. The tent is also very portable as far as hiking is concerned. It is for this purpose that it was manufactured–to walk around with. The material it is made of is also generally light in weight, which contributes to its potability as well. Finally, the price is fair compared to other tents that accommodate the same number of people. This is very important for hikers who are on budget. Why go for an expensive model when Coleman tents offer the same comfort and style at a much cheaper rate? It beats logic, right? From the look of things, it seems Coleman tents are one of the most-preferred tents among hikers across the world. This tent we are reviewing is the ideal tent for hikers, provided the group is not made of more than 6. The features look promising, and the capabilities are robust. There’s enough evidence to state that this tent is the most preferred among people who go for camping expeditions. Currently (as of September 6, 2016), it has more than 1,123 reviews, with an average of 4.4 out of 5 stars. This is the highest ratings we’ve ever seen on a tent selling on Amazon. The majority of the reviews talk about the ease with which they could set the tent up, the comfort level, camping abilities and so forth. However, a few customers still expressed their disappointment, which is why the Coleman 6 Person Instant Tent couldn’t hit the 5 star mark. They said it was so easy, though not perfect. Others said is wasn’t as strong as they’d expected. It might look like we’re overly promoting the Coleman Instant Tent 6 Person with only selfish motives. But the truth is, if the features stated above are anything to go by, then it’s very likely that the tent is above standard. We wouldn’t waste time writing such a long review on something that wasn’t true. Again we emphasize on giving genuine information concerning Coleman tents. 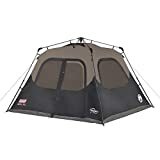 If you really love hiking and you’re always concerned with where and how you’re going to sleep, then Coleman Instant Tent 6 Person is just for you. They come in a variety of sizes to accommodate just about any number of people(though the one we’re reviewing accommodates up to 6 people). Again the price is just fair compared to what you get in terms of features. It’s currently available on Amazon as new and used, so depending on what you can afford, you can always go for any one of the two. When looking for a quality tent, not only do you want something that is reliable and sturdy, but also something that is just as easy to put up, as it is to take down. Furthermore, a great tent should not take up a lot of space when you store it when its not being used. All of these benefits and more can be found in the TETON Sports Outfitter XXL Quick Tent. Whether you are getting ready for your next weekend camping trip, or simply something to put in your backyard where your kids can sleep under the stars, this tent is a fantastic option to select. This Zaltana tent review focuses on the Zaltana Pop up tent. It is one of the best tents for family camping and hiking trips that you can buy. 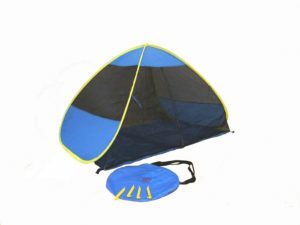 The Zaltana pop up tent is designed to have a dual layer construction. In terms of design, this tent is constructed to be a large blue disk when it is not in use. The disk is equipped with two handles that you use for carrying it with your hands. In case you are hiking for long distances, the manufacturers Zaltana have also provided you with two straps. This enables you to sling it over your back and carry it. This is not particularly difficult since the tent is very light and only weighs a measly five pounds. The disk has a diameter of thirty inches which makes it quite easy to fit into the trunk of your car. It is designed to take up as little space as possible when in use so you will not need a lot of space when carrying it. It also comes with some metal stakes and rings that you will use when setting it up.